Mick McCarthy says Jack Byrne and Josh Cullen are not just there to make up the numbers after their late call-ups into his squad for the double-header with Gibraltar and Georgia. 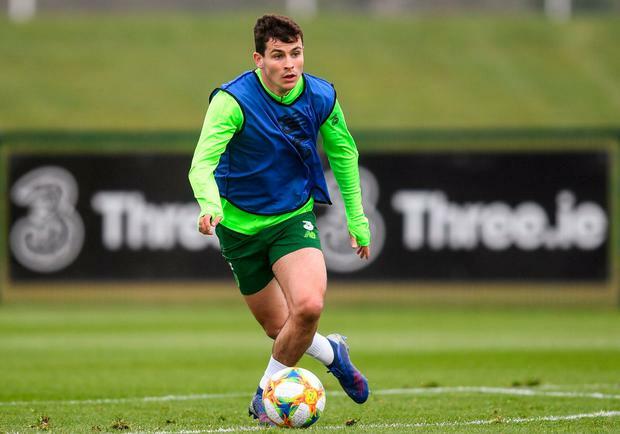 Shamrock Rovers midfielder Byrne (22) and West Ham's Cullen (22) - who is on loan with Charlton - were drafted into the final 23-man panel even though they weren't on the original provisional 38-man list. McCarthy was impressed by the duo on scouting missions and was pleased by their impact in training yesterday. The manager is surprised that a player with Byrne's ability has struggled to find stability in his career. "The two young fellows, Jack and Josh, didn't look out of place at all. I was impressed," said McCarthy, before taking a specific question on the League of Ireland player, who scored once and played a key role in the other two goals during last week's 3-0 victory against Sligo Rovers. "Normally when someone comes in when there's been a 30-odd-man squad and they've not been in it, you'd think he's somewhat down the pecking order. "But just looking at him today, technically he's very good. I had a chat with him and he's buzzing, he loves being in and he doesn't look out of place. I'm not discounting him. I could have gone with the same old, same old, I could have gone back to someone who's been in the squad and brought him in. "If I didn't go to watch games I wouldn't have seen Josh Cullen or Jack. Unless I do that, I might keep going with the squad that's been around and never see anybody else. "Having seen Jack on Friday night (v Sligo Rovers), I thought he was excellent and he deserves to be there. He'll have tougher tests but he really was very, very good. "Why he's not settled at any club before is beyond me. He's very, very talented and he looks like he's got the bit between his teeth." Injuries to Alan Browne and Callum O'Dowda opened the door for the new pair and McCarthy is set to favour players who are playing regularly with their clubs. Glenn Whelan is back with the group, with the manager struck by the 35-year-old's energy even though he's come through a busy spell at Aston Villa.